I grew up on a farm, so I thought it would be interesting to see a play at the Blyth Festival called Beyond the Farm Show. It was different than I expected, and I realized that there is a whole other dimension to farming that I had never been exposed to. I grew up on a cash crop farm, so there was no cows to milk or chickens to feed. My exposure to raising livestock was very limited. Yet, I still could relate to many of the characters in the show like my neighbours or others in the area while I was growing up in Huron County, and I’m sure many in the audience felt the same way. The history of the original Beyond the Farm Show dates back to 1972 when a troupe of actors spent a summer on the farms of Huron County. 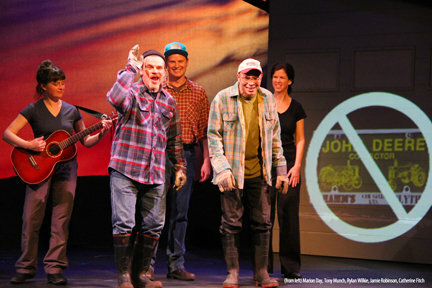 For the 2013 show, the five actors visited and interviewed over 15 farms and their families, as well as some local businesses to learn their stories. You can view a video of how Beyond the Farm Show came to be online. This was the first time I had been to the Blyth Festival. The collective play tackled some controversial issues including wind turbines, increasing government regulations, municipal politics, family relations, and cultural divides between Mennonites and the larger farming community. These are all tough subjects that often don’t get voiced in theatre productions. So it was nice to see that a small local theatre was able to successfully tell the stories (and frustrations) of those in our rural communities. The production wasn’t all serious, as the cast was very entertaining with their jokes, songs, yodelling, and funny animal impressions. If you see the show, you’ll even get to see a real farm animal on stage! For me, the play was both educational and entertaining with some good local history mixed in. Beyond the Farm Show runs until August 16th.